The Boddie team did another great job of hosting a fine drag racing door slammer & motor cycle event. Spectacular Pro Mods competed side-by-side for round-after-round racing. Street and cycle racers competed in a lot of close competition. A thousand spectators, just near the starting line, were witnessing the competition antics and round wins with high emotion! Spark plug readings were abound throughout the pits although air density deviated only between 96 & 99%. Density altitude deviated only between 200 & 1,400 ft. That small amount of air weight change accounted for only a 3% needed change in fuel weight delivery to the racing engine. That is a small change and possibly ignored by some of the better dialed-in setups. EFI racing engines were tuning with the lap top. MFI engines needed only minor jetting changes if any at all. Several Enderle and Hilborn fuel injection setups. Rons MFI as well. Grid and launch control was throughout. Few oil downs. Couple guard rail skirmishes. Big tire as well as small tire setups. Transmission & differential fialures from high powered engines. Some engine fualiures. A lot of high dollar billet & CNC machined racing parts! 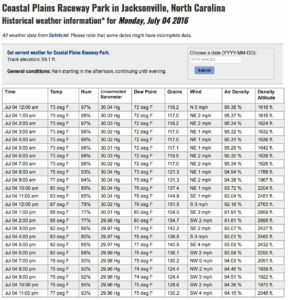 For racers wanting to reconstruct the weekend weather for record keeping, hit the Sacramento Raceway link at https://airdensityonline.com/track-results/Sacramento_Raceway/; hit the hISTORY link on the page; enter the EVENT DATE. All of the air density values for the weekend can be retrieved. That time of year again for the wildesssst drag racing event ever at Sacramento Raceway for mega powered door slammer drag racers running 1/8th mile “all-out” competition. 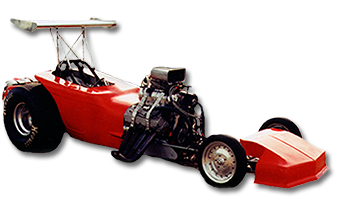 The Boddie Team family, friends, and spectators will be out ‘in mass’ to enjoy a weekend of drag racing. Last year’s events brought out families and friends in a warm and enthusiastic competition event. Everyone was polite and enthusiastic. I felt a feeling of safety at this event, away from the tabloid crisis’ dominating the news! New racers are always showing up with really sharp high powered racecars and motor cycles. Most of these motor vehicles frequent the street for car shows and spontaneous auto events around the circuits. Just about every car or bike model is represented. You get to see what your car or bike could do from watching a similar model running at the track with a mega motor! Cars over 2,000 HP are the standard. Rumor is some of the cars are over 3,000 HP! 4,000 HP! Maybe even 5,000 HP! Some of the bikes are 2 to 3 times their original power levels! How about a turbocharged ‘Harley Hog’ in full dress! 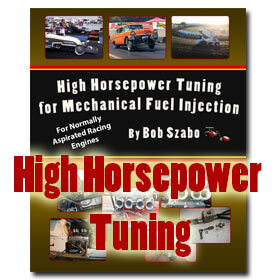 Read those drag racing spark plugs for good air density tuning at the http://aaafamosoraceway.com/; Mar 7-10, 2019. 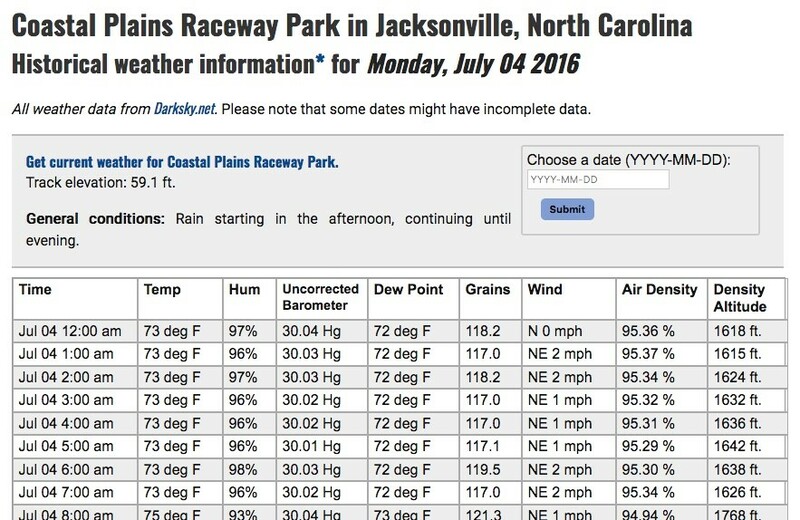 Check https://airdensityonline.com/track-results/Bakersfield_Speedway/ for current air density, density altitude, water grains, temperature, humidity, uncorrected barometer, wind speed, wind direction, dew point, saturation pressure, vapor pressure in imperial or metric units. Check https://airdensityonline.com/track-history/Bakersfield_Speedway/ for yesterday’s record already determined in air density units. Check https://airdensityonline.com/track-forecast/Bakersfield_Speedway/ for tomorrow’s forecast already determined in air density units. 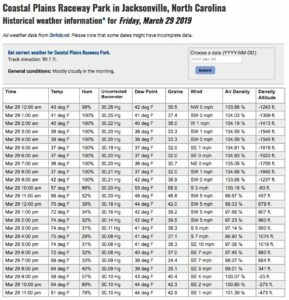 Check https://airdensityonline.com/free-calcs/ for free air density calculations determined in air density units. Check https://airdensityonline.com/procalc/ for racing mechanical fuel injection jetting calculator. Check airdensityonline weather, las vegas for yesterday, current, and forecast air density for tuning; track map; elevation; water grains; wind direction; wind speed; weather forecast; data displayed in Imperial or metric units; air density data valuable for racers without portable weather stations; for racers with portable weather stations, data valuable for re-calibration, especially after a long bumpy drive. 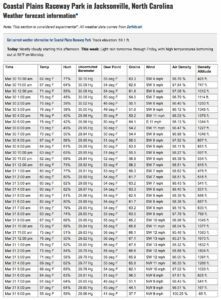 Read those spark plugs for good NHRA drag racing preseason tuning; check https://airdensityonline.com/track-results/Wild_Horse_Pass_Motorsports_Park/ for current air density, density altitude, water grains, temperature, humidity, uncorrected barometer, wind speed, wind direction, dew point, saturation pressure, vapor pressure in imperial or metric units; yesterday’s record and tomorrow forecast already determined in air density units. Check https://airdensityonline.com/free-calcs/ for free air density calculations. Check https://airdensityonline.com/procalc/ for mechanical fuel injection jetting calculator.